Set to be one of the blockbuster movies of 2013, director Alfonso Cuarón’s Gravity is a 3D space thriller following the exploits of two astronauts on a mission for survival after the destruction of their space shuttle in a catastrophic debris collision that initiates a self-sustaining cascading event known as Kessler Syndrome. Starring Sandra Bullock and George Clooney, the film explores themes around shipwreck, abandonment and humanity’s survival in the wilderness, while also attempting to realistically depict safety in spaceflight and space walks, and with the inherent dangers of extraterrestrial exploration. Cuarón crafted the film in painstaking detail to keep the engineering, the aesthetics and the science as close as he could to reality, but he admits that liberties had to be taken and scientific inaccuracies included in order to maintain and drive the narrative. Film critics and scientists alike have praised the movie’s attention to detail and realism. One expert who offered a notable online critique of Gravity is the astrophysicist Neil deGrasse Tyson, the well-respected head of the Hayden Planetarium in New York’s American Museum of Natural History. On 6th October 2013, Tyson posted a remarkable series of Twitter tweets highlighting technical blunders in Gravity (while also confessing that he thoroughly enjoyed the film). His tweets created an enormous response including television reports on Inside Edition, The Today Show and NBC Nightly News, along with many other news stories, blog posts and online discussions. Tyson himself was shocked at the fuss created around the handful of tweets he had sent over the course of an evening and was moved to write an open letter on 9th October explaining his motivations and offering praise for the many accurate details of space and space travel depicted in Gravity; we shall return to this message later. In his original stream of Twitter posts, Tyson highlighted some faults with the film and also raised some interesting issues around extraterrestrial travel and the safety of human beings exploring outer space. He started by noting that Gravity is possibly an inaccurate title and suggested names which better reflect the forces that the characters experience during the film, either Zero Gravity or Angular Momentum. 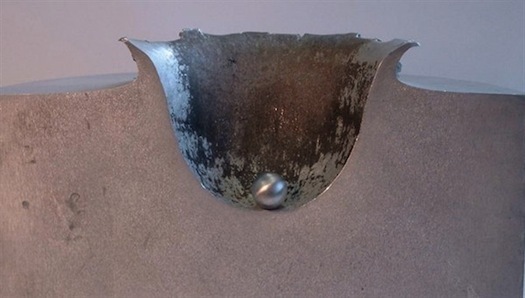 This crater resulted from firing a small aluminum sphere at 6.8 km/s at an aluminum block. Low Earth orbit spacecraft can travel twice as fast (Credits: ESA). Tyson notes that, despite technical errors in details, one of the central aspects of Gravity highlights a very real danger for space travel – that of collision with the existent and ever-growing amount of space junk orbiting the Earth. In the few decades that humans have been sending spacecraft, satellites and manned missions into space a huge collection of manmade objects have been left in orbit. NASA’s Orbital Debris Program Office researches, collects data and records orbital debris – more than 500,000 pieces items of space junk are currently being tracked, from nuts, bolts and chips of paint to boosters, rockets and entire dead spacecraft. There have been incidents that in some ways echo the storyline of Gravity including an event in 2006 when a the space shuttle Atlantis collided with a fragment of microchip – the tiny piece of debris blew a hole in the shuttle’s cargo bay radiator panels – and another in June 2012 when a micrometeoroid hit International Space Station’s Cupola. If mankind is to learn the lessons of polluting our own planet, we should be extremely careful about leaving waste in the Earth’s orbit and deep space. As Gravity suggests, the space debris issue is getting alarming, and engage in mitigation and remediation measures to solve the issue. This will be crucial for the safety of future space exploration. In the video below, an amusing feature about “Everything Wrong With Gravity – With Neil deGrasse Tyson,” by CinemSins. Tyson goes on to question whether Bullock’s character, a medical doctor, would have the necessary qualifications and experience to take part in the space mission, specifically to service the Hubble Space Telescope and perform highly skillful and dangerous space walks. “Gravity” astornaut Matt Kowalski (George Clooney) releases his tether before floating off into space (Credits: Warner Bros.). 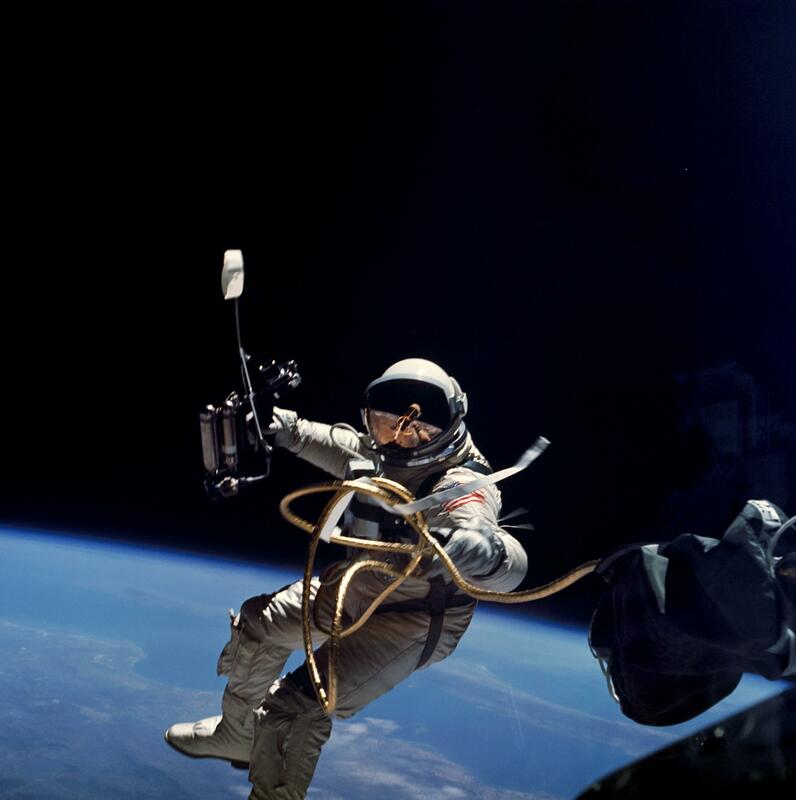 Ed White, the first NASA astronaut to undertake an EVA. EVAs in real life thankfully involve more work and less drama than those on film (Credits: NASA). Upon its release Gravity received almost universal consensus amongst film critics and audiences that it is an exceptionally good piece of moviemaking with outstanding direction, storytelling, acting, soundtrack and stunningly realistic visual effects. Quentin Tarantino placed it in his list of the year’s best movies so far for 2013, while James Cameron stated Gravity is, “the best space film ever.” Cameron created two of cinema’s finest films depicting deep space and deep sea exploration – Alien and The Abyss – so his praise is certainly a high compliment from the film industry. 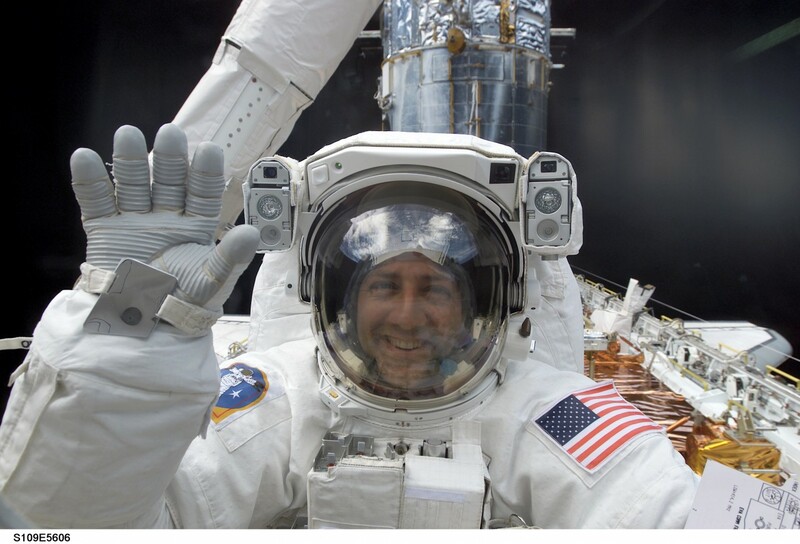 Mission Specialist Mike Massimino on EVA in 2002 to replace the Hubble’s port solar array – the real life version of the EVA shown in Gravity (Credits: NASA). Perhaps the most telling opinions on Gravity come from the select few who have actually experienced the realities of space travel: real-life astronauts who have completed space missions. Astronaut Michael J. Massimino praised Gravity noting that, “nothing was out of place, nothing was missing.“ He went on to highlight the exceptional attention to detail: “There was a one-of-a-kind wirecutter we used on one of my spacewalks and sure enough they had that wirecutter in the movie.” Buzz Aldrin, one of NASA’s most famous astronauts and the second human to set foot on the Moon, commented that when watching the film he was, “so extravagantly impressed by the portrayal of the reality of zero gravity.” Aldrin also noted that the film depicts an entirely possible and extremely dangerous accident stating that, “we’ve been fortunate that people haven’t been in those situations yet. I think it reminds us that there really are hazards in the space business, especially in activities outside the spacecraft.” Fellow astronaut Garrett Reisman also praised the film’s realism and accurate portrayal of space travel. To conclude, Gravity is an ambitious attempt to relate the realities of space travel and spacewalks and the inherent dangers in these activities, while also telling an engaging and gripping story, and the film is largely successful in all these aims. Image caption: “Gravity” astronauts Ryan Stone (Sandra Bullock) and Matt Kowalski (George Clooney) repair the Hubble Space Telescope (Credits: Warner Bros.). Thanks for a concise summary of experts’ opinions. I have been resisting seeing it because of its flaws but will probably relent. Please note: Earth satellites are in “Earth orbit”. Far fewer items are found in “Earth’s orbit,” mostly Earth and Moon and miscellaneous debris. A small nit but I don’t think the term “Zero Gravity” really exist in space. There is still some gravity even in space. Perhaps,the more proper term should have been weightlessness or free fall. Zero, plus or minus 0.01 m/s^2. Great movie – very enjoyable. But the scene where George clooney is buzzing round leaving sandra bullock to do the repair work was virtually impossible. a few puffs of propellant gas would not move george (and spacesuit) anywhere – not unless that is he had unlimited fuel and a few days to spare……. The year is 2014: We have far too many movies that rely on special effects. Yes, they’re impressive, but I long for movies with character. Put it this way – if this were the first movie I’d ever seen with impressive special effects, I’d probably be singing a different tune. Yet, I’ve seen countless movies with impressive computer magic and it just isn’t enough any more. The acting was weak – the report between Bullock and Clooney was forgettable. The film I thought was terrible. Admitted, only watched a DVD version, but the story line was incredibly weak, not very interesting and quite frankly, to quote an old phrase, about the survival of Sandra Bullock, Frankly my dear, I don’t give a damn’. One of the more amusing incidents is, knowing that they are in a bad situation George Clooney decides to use previous suit fuel in picking up a dead body – and also wasting time into the bargain. Secondly, when traversing to the iss, George Clooney (after already wasting a lot of fuel) decides to wait until the last second before correcting to land with the ISS, whereas, everyone knows, the most efficient use, would have been to make course corrections from as far away as possible to ensure the maximum efficiency of conservation of the fuel aboard his suit. In truth, I wish I had not bought the movie at all and consider it a total waste of time. When will film makers realise that technical effects are no substitute for good writing and good plotlines. Although the running time was 88 minutes, there was only 80 minutes of movie and I must admit, after about 30 minutes I was looking at the DVD time switch just to see how much longer this would go one. And of course, the biggest technical error of all, there are no space shuttles in service as from some time ago. When Sandra Bullock’s character was rotating on the end of that arm wouldn’t the time of her release make a big difference in the direction she went? So there was no mention of that timing in the movie or in discussion of how scientific the movie was. The wrong timing would send her farther from the shuttle at a higher speed than she was moving with the arm. You are right, the release timing would certainly be critical. I would not expect such a point to be made in the movie per se – there were much bigger physics issues, such as why George Clooney’s character drifted off into space after releasing his tether instead of continuing in the direction of his momentum. It bothers me more that Dr. Tyson highlighted the floating teardrop as one of the good parts of the movie – in real life, it would have been stuck to her eye! It is fun to nitpick these things, but as Dr. Tyson pointed out, we wouldn’t bother at all if the movie was totally divergent from reality – and it did provide some splendid views from space and of spacecraft. Even if its grip on physics was a little loose! Too much bad science but what I want to pick up on is the Vostock with CCCP painted on the outside of the vessel. CCCP ? Come on fellas ; where were you whwn the wall as pulled down ? Or are you still under it.